With this in mind, in my opinion, using MasterWriter will give you that all important edge and help you get from good to great. The comprehensive reference, tools, and organizational features, together with the ease of use, makes it a powerful songwriting tool. 2 – Word Families is a dictionary that will open up a new world of possibilities for unique and imaginative descriptive words and ideas. 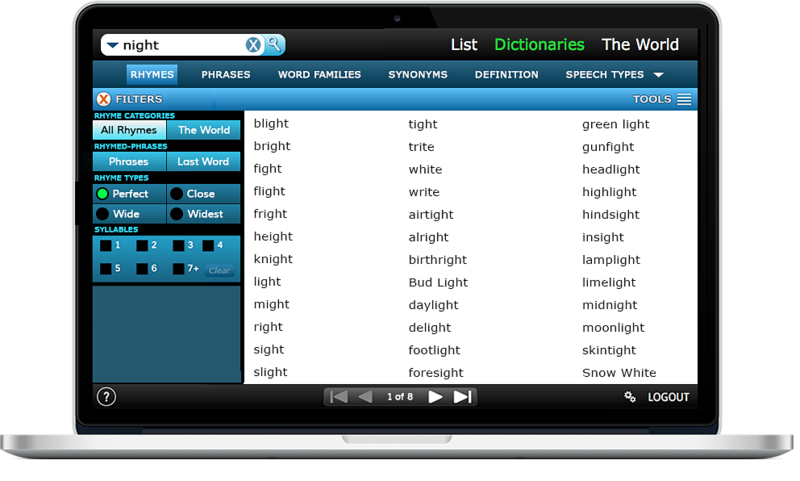 3 - The Phrases dictionary will show you every phrase that contains your search word or you can search the entire list. This is an idea factory that is filled with hooks. Say goodbye to “writer’s block”. 5 – Figures of Speech gives you instant access to metaphors, similies, idioms, oxymorons, onomatopoiea, allusions, alliterations and Intensifiers, a new one-of-kind dictionary of intense descriptive words. Also included are filters that allow you to be more specific in your searches. This is an amazing source of ideas and directions that will spark and greatly enhance your songwriting. When you enter a search word, all of the dictionaries search simultaneously. Why struggle to find the right rhyme, word, or phrase when MasterWriter will show you all the possibilities in an instant? 6 – The World; a Pop culture Dictionary with over 11,000 Icons of American and world culture that links to information on each entry, plus a searchable Bible, Old and New Testaments. 7 – An easy to use audio page to capture your melodies. 8 – A built-in word processor plus organizational features that organizes the songwriter painlessly. Come back to that song, days, weeks, or months later and you will find your lyrics, melodies and work product organized and waiting for you under that song title. If you offered professional athletes a program that would make them only 5% better, I’m betting they would buy it at any price. MasterWriter will make you a better songwriter and by a lot more than 5%. Why wouldn’t you want that edge? Hit Songwriter/composer/artist Barry DeVorzon has long been a prominent name in the recording industry. His work in motion pictures and television has resulted in a number of hit records and soundtracks: “Bless the beasts and the Children”, recorded by the Carpenters, Nadia's theme (theme from the Young and the Restless), theme from “S.W.A.T” by Rhythm Heritage, “In the city” by the Eagles, “No More Drama” by Mary J. Blige, and the theme from “the Warriors”. He was nominated for an academy award for “Bless the beasts and the Children” and won a Grammy for Nadia's theme. His music for television has earned him six Emmys and numerous nominations.